I desire silence. I want to be free from the noise that humans make. I fear I will never be free from this noise. I'm often in the woods and I still hear a car that is miles away or a plane flying overhead. And even my own sighing and thoughts can become too noisy. The sounds of nature, however, rarely irritate me, even the Carolina Wren's repeated tea-kettle, tea-kettle and the chipmunk's repeated chirping at my cat sitting on the porch window sill. But what about the voices of the past? What about listening to ghosts? A friend mentioned he requires transitional time from working all day as an emergency room nurse. I responded that I didn't know how to transition from working with dead people all day. Writing historical fiction requires listening to the voices and noise of the past. Perhaps this is why I'm sensitive to the noise of the present, except for the birds and creatures outside who lull me into the past like planxty, the strange music said to come from the fairy world. Of course, writing historical fiction requires much more than silence and romantic notions! The immense labor in research and study makes me think digging the Erie Canal with picks and axes would have been easier (not really). I’m currently researching and writing a fourth novel set in New York City during the Civil War. But mostly, I’ve been traveling to promote, speak, and sell books, and this is so unlike listening to ghosts and is so rooted in the present that the otherworldly sounds fade. Then I feel I’m listening to the incessant, loud, but yes, remarkable, five songs of the Northern Mockingbird, into the dark of night. These songs are repeated again and again. I’m afraid I once thought (as a very young person) I’d write a good book, get it published, and it would take care of itself. And then I’d go to my attic and write the next one. Ha! I’m intrigued by the Northern Mockingbird and welcome him to my backyard. I hope to intrigue my listeners at my book events with my repeated five songs, as well. But I can’t wait to get back to silence and listening to ghosts and hope that my Northern Mockingbird, who is usually a permanent year-round resident, will go south for the winter. I recently was in Chicago at IBAM (Irish Books, Art, and Music) and sat on a panel titled, New Perspectives on the Irish Famine. It was an honor to sit with esteemed academics and historians. I was the only woman and the only person without an Irish accent. At first, I was so rooted in the present fear of speaking that all I could hear was the sound of my heartbeat. Even the five repeated songs of the Mockingbird disappeared. But after I gave my ten minute speech, I listened to the other members of the panel. And it was then I listened to ghosts. New ones, perhaps, but they came from the same family of ghosts I had listened to long ago. And suddenly, there was a new song or two added to the repertoire of the Mockingbird. Listening doesn’t only happen in the attic. It can happen, and perhaps, must happen, everywhere else, as well. 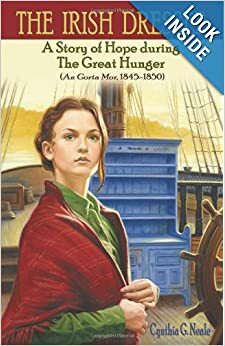 I wrote The Irish Dresser, A Story of Hope during The Great Hunger (An Gort..., published in 2004. I’ve written subsequent novels with the same protagonist, Norah McCabe. I thought after the first book and donating a percentage from the sales of my book to Oxfam, I’d be pretty much done with the Famine. I’d go on to listening to other ghosts. In 2003, I nearly gave up looking for a publisher for The Irish Dresser until I received a book titled, Surplus People, by Jim Rees. It gives an account of the entire estate of 6,000 farmers in County Wicklow who were sent packing by the landlord to N. America. In the index of the book, there are names of some of these families and one family is listed as the Neale family, my last name, and one of the girls was the same age as my protagonist. The name of the ship they traveled on was called The Star, the same name of the ship I had chosen; unbeknownst to me there was a ship of that name. My ancestors were whispering in my ears to tell their story. After the second book was published, I learned there was a real Norah McCabe come from Ireland to NYC in 1847. I tell this same story over the years like the Northern Mockingbird with five songs. But after being on the panel with Tim Pat Coogan and the other panelists, I heard the planxty and saw new ghosts rise before me. There has to be more songs and from what I’ve learned about the mockingbird, there can be up to eighteen. I’ve come home from traveling renewed, humbled, but inspired to continue to listen to ghosts, but to not limit where and when they speak. I’ve come home knowing I only have so much time in this life and I’d better scale back and change some things. And I came home knowing I will always speak about the Famine, for the Famine victims, and do what I can about hunger issues of today, no matter what other books I write that have nothing to do with the Famine. When I met you at Irish Fest 2011 in Milwaukee, we talked about listening to ancient voices speak. It is always important to be aware of the ghosts that speak..They will tell you marvelous stories... They want their side told... I have dreamt a conversation with someone from another place & time and awakened the next morning to find a piece of writing on my Computer screen. A guest in my house one time, up in the wee hours of the night, came across me sitting at my computer typing. Even though they said something to me, I didn't reply. They were telling me the next morning that it was like I didn't hear them. My son said "Oh, yeah, mom was ghost writing again", which only confused them more. I always find writer's inspiration 'inspiring' especially when there are so many synchronizations from behind the veil...love it. Looking forward to working with you on your Sibin!